224 nm to go to the finish. Her ETA is now around 0300 tomorrow morning. Back in the race proper the biggest monohulls are now round the Fastnet Rock and, thanks to their now sailing downwind are pulling ahead under IRC. 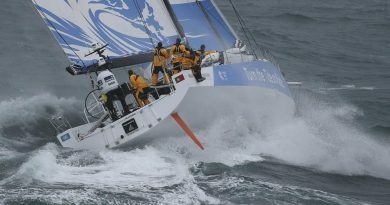 At 0900 CET Rambler 88 was mid-Celtic Sea on a long gybe east, but had pulled into the lead, not just in IRC Zero, but overall under IRC, taking over the yellow jersey from the biggest boat in the Rolex Fastnet Race, the 115ft Nikata. 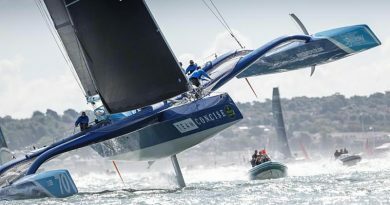 These two giants displaced the smaller French boats Codiam and Pintia from the overall lead, although they remain ahead in IRC One and IRC Two respectively. IRC Two are following a similar regime, however their lead trio on the water, Gilles Fournier and Corinne Migraine’s J/133 Pintia, Nick and Suzi Jones‘ First 44.7 Lisa (skippered by RORC Commodore Michael Boyd) and Frans and Carla Rodenburg’s First 40 Elke, all headed up the west side of the TSS while James Sweetman’s First 40 Joanna of Cowes led the group up the east side off Land’s End. 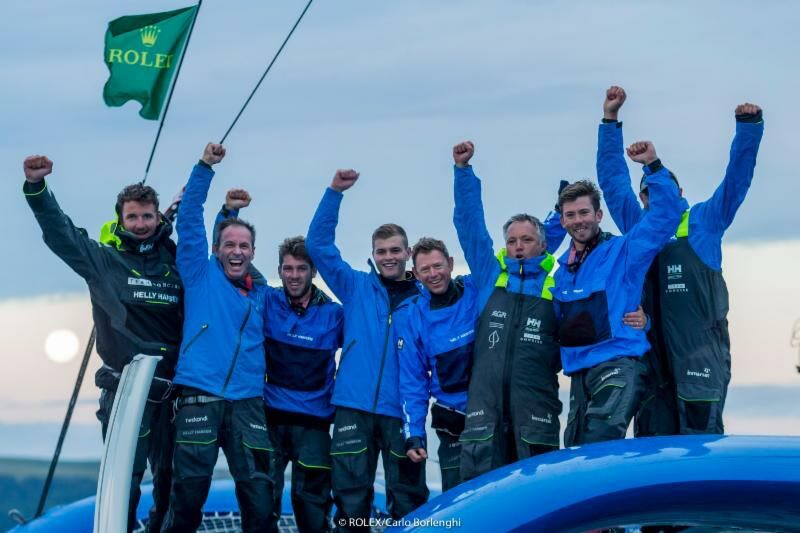 The leaders in both groups tacked at around 0400 when they were close to laying Fastnet Rock. Conversely the first group of boats in IRC Three took the eastern side of the Land’s End TSS with Ed Fishwick and Nick Cherry on their Sun Fast 3600 Redshift Reloaded leading (on the water) up the east side alongside Ian Hoddle’s sistership Game On. Meanwhile yesterday’s IRC Three leader on corrected time, Altikhan – Linxea Valoris & Benefits, the A-35 of France’s Johann Bouic, was first on the water heading up the west side of the TSS. However Arnaud Delamare and Eric Mordret’s JPK 10.80 Dream Pearls is now leading IRC Three on corrected time. Incredibly, the leaders among the smallest, slowest boats in IRC Four are also up among the IRC Two and Three boats. Again, there have been significantly differing tactics here with the two French JPK 10.10s: the Loisins‘ 2013 winner Night and Day and Noel Racine’s Foggy Dew taking the eastern route while the present IRC Four leader, Paul Kavanagh’s Swan 44 Pomeroy Swan, had gone west. 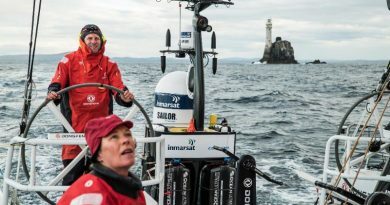 Among the professional classes, the stand-out performance remains that of the doublehanded crew of Paul Meilhat and Gwénolé Gahinet on the IMOCA 60 SMA, which is not only 23 miles ahead of the next boat in her class but also 7.5 miles in front of the first fully crewed VO65 Dongfeng Race Team. 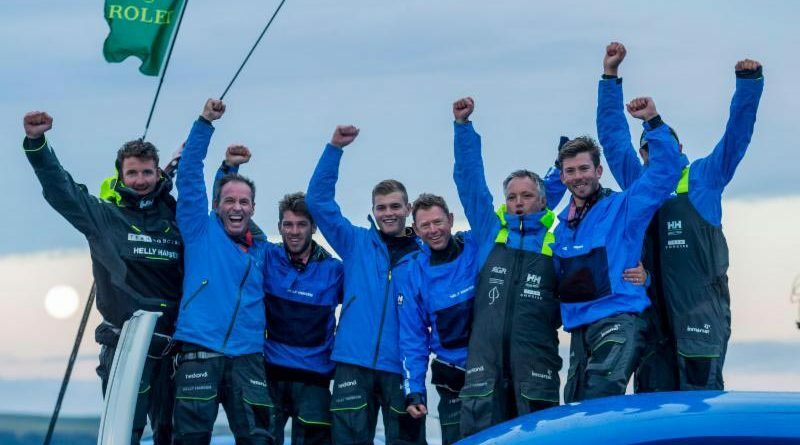 Among those VO65 crews competing on Leg Zero of the Volvo Ocean Race, the Chinese VO65 was first to round the Fastnet Rock at 07:58 this morning, followed eight minutes later by Team Akzonobel and then Mapfre. Bringing up the rear was Dee Caffari’s fledgling crew on board Turn the Tide on Plastic at 08:55. All seven VO65s initially headed south with MAPFRE the first to gybe east. Armchair sailors will be able to test their skills on the same course as competitors in the 2017 Rolex Fastnet Race. Watch out, it’s addictive!